So, you want a crosscut saw….. You probably don’t know what your getting yourself into. Let me impart the lessons I’ve learned. First, what do you intend to do with it? (A) display it as art / a wall hanger (B) use it as it was intended. To cut wood (C) both!!! As for me…. I fall in to category C, both. For those that fall in category (A), the most important thing is, obviously, the visual appeal. Do you like it? Is it something you would proudly hang over the mantle? That can be dependent on others in the house as well. Some people are comfortable displaying a “barn fresh” piece. Others may not be so fond of having a “tetanus trap” hanging on the wall. IE.. an old rusty saw. It is very dependent on ones taste. It is a conversation piece. Lets not make it an argument. LOL. If you wish to use it for its intended purpose. Category (B) types. That’s where it gets dicey. There are lots of crosscut saws out there. Picking one up in the price range your looking for may or may not work. With crosscut saws, properly sharpened they are said to “sing”. if sharpened improperly, they earn the name of “misery whip”. There are many of those out there. If your anything like me and believe that in the era of crosscut saws, people knew how to do things, and they should work fine… That’s not always the case. More to come one that. I, love crosscut saws. They are something I am fairly passionate about. A category (C) type. They should look great on the wall and be able to accomplish the task they were designed to do. Cut wood. My personal interest covers the gamut of the history and practical purposes. I have restored quite a few saws. I always look for ones that can be made serviceable. As well as look great on the wall. A lot of times people have dreams of painting a picture on them. That’s fine for those that have the artistic ability to do so. Preferably on one that cant be made serviceable. I know my limits. I chose to make them look great as well as be serviceable. Crosscut saws are still being used today. Primarily in areas that are “environmentally friendly” or where packing a heavy chainsaw up a mountain is impractical for trail maintenance. Most of that can be found in the pacific north west. The vintage saws are preferred due to the characteristics of the steel. What ever that may be. Crosscut saws are still being made today. So if function is the deciding factor, that may be the way to go. Today, the necessity for using a crosscut saw isn’t so vital. If you are, or know a prepper, form an function may be good. Preppers have most everything they need, so a nice looking functional crosscut saw would probably make a great gift idea. Finding a saw that will work in the condition you bought it in is a bit unlikely. Most of what I find shows evidence that people didn’t know how to take care of them. Typically that evidence is in the form of breaking the first rule…. Never try to sharpen a crosscut saw in the field!!!!! Even if it was sharpened back in the barn, it was probably done wrong. Sharpening a crosscut saw requires knowledge of how the saw works as well as having the specialty tools to sharpen it properly. Its easy to end up spending around 200 dollars on the tools. Vintage saws are usually found in conditions ranging from bad to worse. LOL.. There’s a shop here that has a blade hanging for “decoration”. The rakers are painfully and obviously to long. I would hate to imagine the last person to use that saw. The teeth need to be close to the same length and show little sign that they have been sharpened a million times. Missing parts are pretty common as well. 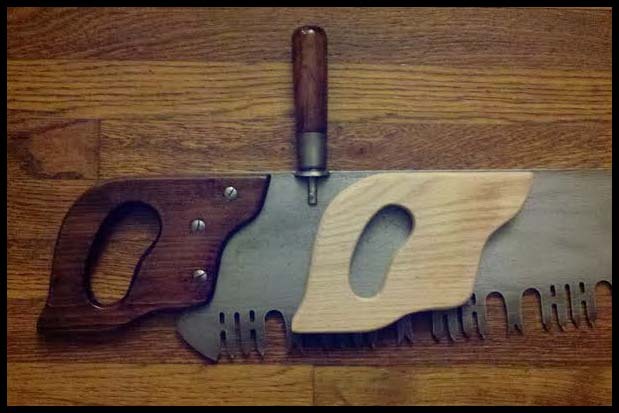 If you wish to use it to cut wood, make sure the parts are all there. It is easy to think that you can just pick up a handle and it should work. That is not the case. There were many manufactures and they didn’t go off the same patterns. The holes may not line up for the “D” handle. And even the helpers handle may be the wrong size. Not to mention that the parts can be rather pricy in relation to what you can pay for the saw itself. And if it doesn’t fit, your relisting something you just bought. To sharpen one first requires setting the offset of the cutters. Setting the teeth is the only thing one should do in the field. Next is jointing the saw. That makes sure that every tooth is doing an equal amount of work. After that, you will sharpen the cutters. Then comes the tough part, sharpening the rakers and making sure they are at the correct length. The rakers are a little shorter than the cutters. They act like a plane. (rakers are the Y shaped teeth) If the saw is running properly, it will create what is called “noodles”. Noodles are long shavings rather than saw dust. Are there people out there that still sharpen crosscut saws? Yes there are. Few and far between. If your lucky, you can find someone locally. Pricing is about $10 a foot. That’s probably for a working saw. A basket case covered with rust, who knows? All I can imagine is a professional sharpener with a stack of saws that people were unwilling to pay the return postage for a saw that would cost to much to restore. Assuming it could be restored. The Blade has some other considerations. Does it have the makers mark? The major players in the field would etch their “brand” on the blade. Even back then, people were very brand loyal. Preserving the etching requires more time and effort. Expect to pay more. Those should be preserved when ever possible. The saw Pictured in this post has no identifying marks by means of etching or a medallion on the handle. Condition and visual appeal are equally important. Another characteristic is striations running the length of the blade. The metal used was milled, creating those striations. They are original to the blade. Taking an angle grinder and removing rust and polishing the blade takes it from “original”. That kind of saddens me. Insert hanky. LOL. In some cases its not such a big deal. In others I’ve seen, it totally ruined the saw. Pitting is another common condition of the blade. Rust causes pitting. There’s surface rust and there’s pitting. Does pitting affect the function? Yes, sort of. Pitting can collect sap and create more friction. If the blade is properly oiled and the offset is good, the effect is minimal. For blades with lots of pitting, I will usually blue it. Blue it like a gun barrel. It helps prevent further rust and is good for creating more contrast on a light colored wall. I have one that is blued that I have used to cut firewood while camping. It’s actually pretty durable. I like my fires, what can I say? Hopefully this post helps you make a good decision when looking to buy a crosscut saw. The market is pretty insane. What someone thinks they have and the reality, can be two different things. There is more to say about crosscut saws. I will most likely post more since I love them so much. LOL. At this point I just wish to give you some info for making your decision on what to buy. Till the next post on crosscut saws, take care and good luck. 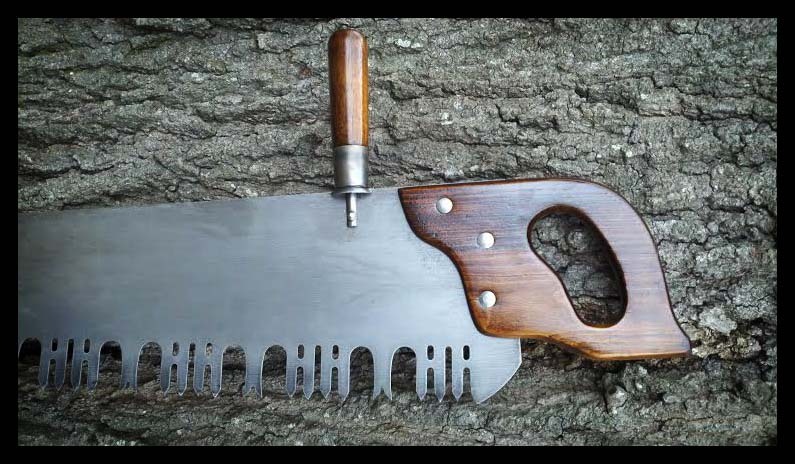 This entry was posted in VaCreepingOutdoors and tagged blade, buying, crosscut, cutting, fire, for, info, information, look, outdoors, preparedness, prepper, reconditioning, saw, saws, sharpening, survival, to, vacreepinoutdoors, what, wood. Bookmark the permalink.